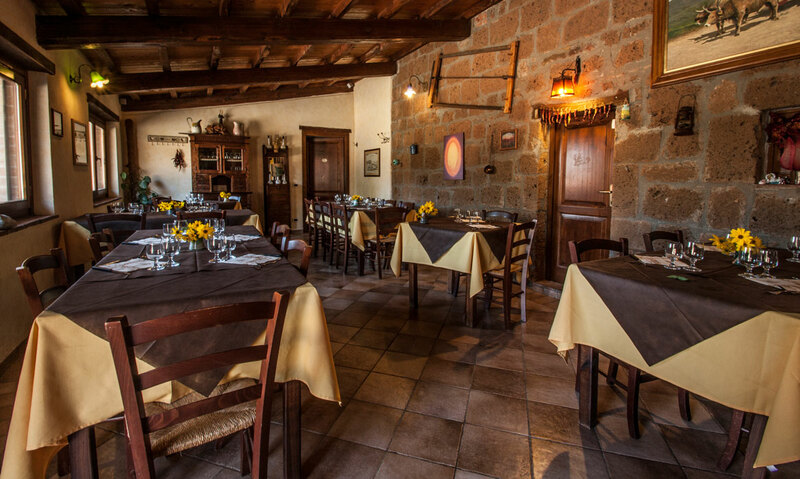 The Aia del Tufo agri-restaurant opened in 2006 and is also open to non-guests and seats 30. 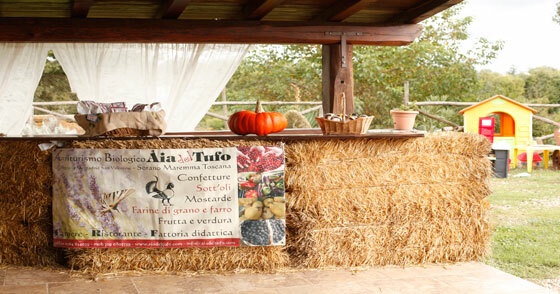 The building is a restored outbuilding next to the agriturismo. A room with the fireplace is available for those looking for an intimate setting or a romantic dinner. All of our dishes follow traditional recipes and have the taste of good home-cooked fare and are appreciated by lovers of healthy and authentic food. 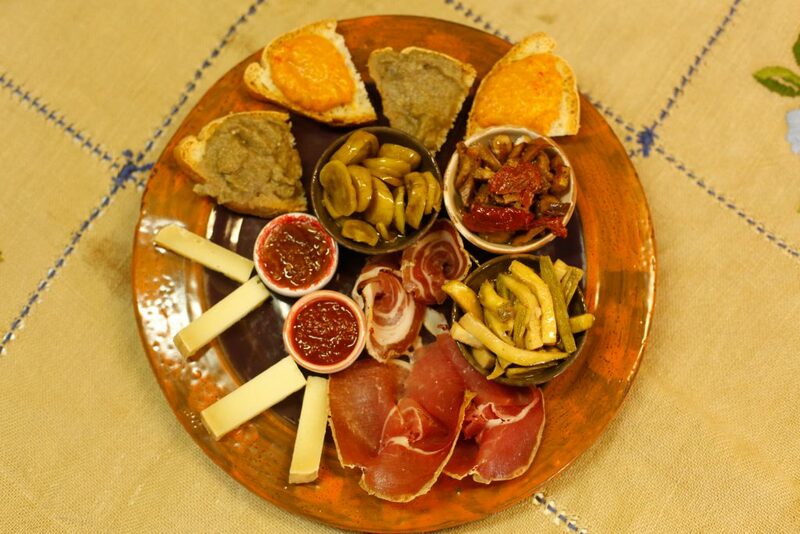 Our starters include the lost flavours of home-made cold cuts, ham, capocollo pork, soppressata (dry-cured pork), salami, sausage made from pork or for the real food-lovers of the Tuscan “Cinta Senese” pork breed or wild boar, but also our vegetables in olive oil and the finest pecorini from craft dairies accompanied by our own chestnut honey and sauces. All of our pasta is home-made: tagliatelle, pappardelle, pici, ricotta and spinach tortelli, lasagne, potato gnocchi served with traditional sauces of wild boar, garlic, porcini mushrooms and meat and tomato sauces. You can also try out typical soups such as “acquacotta”, excellent in summer with our home-grown vegetables, ricotta soup and soup “made to an old recipe”, creamy potato and truffle soup. As a second course, all the meat cooked by us either derives from our farm or is bought from small producers and features the Agriqualità guarantee. You can choose between plain wild boar with black olives, lamb “al buglione”, pork fillet with porcini mushrooms, rabbit cooked the hunter’s way and a mixed grill. The bread is home-made and cooked in a wood-fired oven and our own very high-quality olive oil is instantly recognizable to the taste. The red and white wines are produced by the inherited experience of the owner, Alfredo, a light wine which – as Alfredo says – like the vineyard itself, avoids the use of preservatives. An unmissable end to any meal are our delicious desserts lovingly prepared by Alessia, the “tozzetti” (almond dunking biscuits) with sweet Vin Santo wine, raspberry or chestnut ricotta mousse, chocolate and cinnamon tart with lemon cream and fruit and cream with puff pastry. 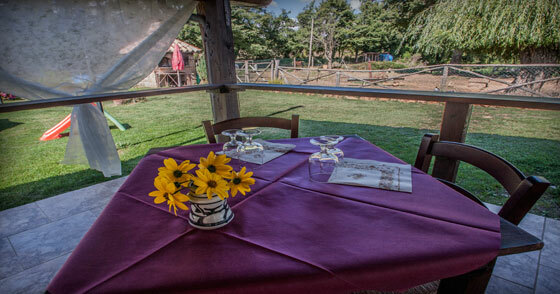 During the summer you can eat in the open-air in our gazebo overlooking the lakes and the fields full of animals and digest during a peaceful walk in the wood along a path that leads to the river Vaiana accompanied by our dogs who are ever ready to lead and keep you company.